A vertical venetian blind divides the room. Its slats are white on A common scaffolding stands in the gallery with one speaker on top emanating an abstract and low volume electronic sound. Upon listening for a while, the visitor can notice slight and subtle, almost imperceptible, changes in the sound. Nonetheless, simple scaffolding can spin numerous references. 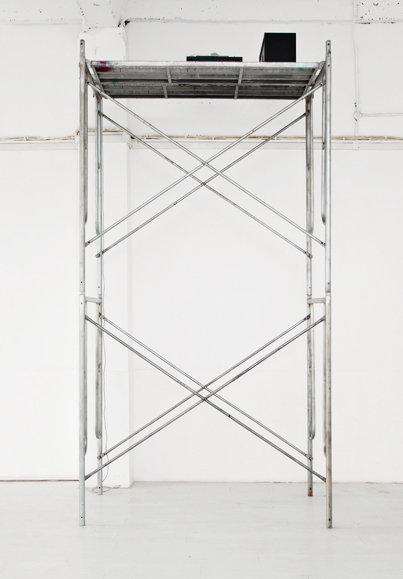 Most immediately, scaffolding suggests a tool of construction and deconstruction, or a means of change.The other significant element of the installation, the single speaker emanating the sounds from the top, offers visitors other possible interpretations. On the one hand, that such a large structure supports only one small speaker suggests an absurd situation. From another perspective, it could just as well suggest both a simply real and even a meta-poetic distance.